The essay topic was: Is it important to live in a democracy? Winners come from Argentina, China, Colombia, Ghana, Hungary, South Korea, Tunisia, and the USA. Read their different perspectives, drawn from current and historical cases, theory, and their own experiences. Clearly the topic of democracy resonated with many students around the world. The contest received more entries this year than ever before, with representation from schools in 65 countries. Students approached this topic in different ways. They weighed current and historical cases. They applied and critiqued political, moral, and economic theories. 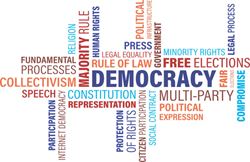 They considered the protections, inefficiencies, opportunities, and inequities associated with democracy in practice. And they related their lived experiences to fundamental questions about the way societies ought to be governed. Thanks to all who submitted essays. The contest received more entries this year than ever before, with representation from schools in 65 countries: Algeria, Argentina, Australia, Bangladesh, Belarus, Belgium, Brazil, Bulgaria, Canada, China (including Hong Kong), Colombia, Comoros, Croatia, Eritrea, Estonia, Ethiopia, Georgia, Ghana, Greece, Honduras, Hungary, India, Indonesia, Iran, Israel, Italy, Japan, Kazakhstan, Kenya, Korea, Kyrgyzstan, Liberia, Macedonia, Malawi, Malaysia, Mauritius, Mexico, Montenegro, Mozambique, Myanmar, Nepal, Nigeria, Pakistan, Philippines, Qatar, Russia, Rwanda, Singapore, Slovenia, Sri Lanka, Syria, Sweden, Taiwan, Tajikistan, Tanzania, Tunisia, Turkey, Uganda, Ukraine, the United Arab Emirates, the United Kingdom, the United States, Venezuela, Vietnam, and Zimbabwe.